GM Building EV In U.S. Now — A story that won’t be played up on ABCCNNBCBSNYTWAPO is the recent declaration that General Motors will build its new electric car in Orion, Mich. rather than out-of-country as had been planned. 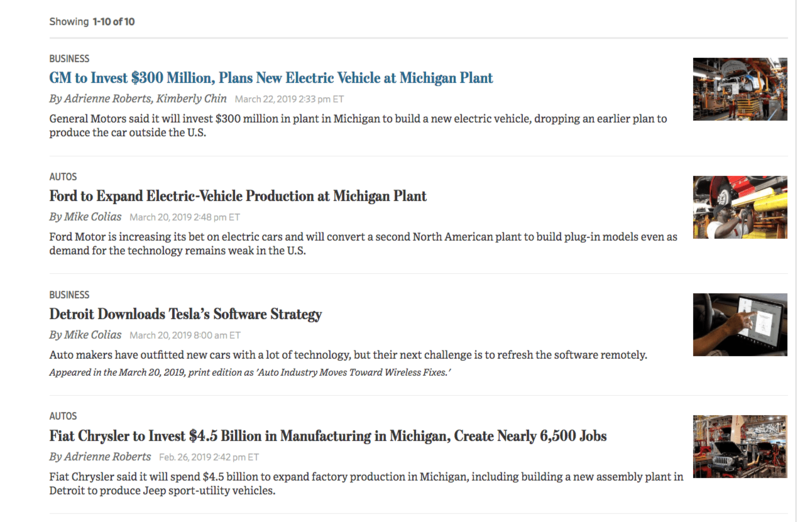 A March 25 screen shot of recent stories in the Wall Street Journal concerning auto manufacturing expansion. GM will invest $300 million in the plant. The reason for the switch given by GM CEO Mary Barra is President Trump’s pledge to end NAFTA and replace it with the still-to-be-ratified U.S.-Mexico-Canada Trade Agreement.